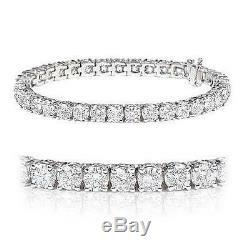 Beautiful Diamond Bracelet 5.00Ct Round Diamond Tennis Bracelet Crafted in 18k White Gold. Visit us at our Hatton Garden Shop. We do not sell enhance Diamonds. All our diamonds are 100% Natural. 18k White Gold (Hallmarked by London Assay Office). Diamond clarity is the gauge of how clear and flawless a gem is. Very few stones are perfectly flawless most contain at least minor mineral inclusions or tiny cracks. The more visible those flaws are, the less valuable the stone is considered. F/IF :- Flaw less / Internally Flawless top most quality diamond ; Highest clarity and most Expensive. Minute inclusions only seen under 10x magnification. VS1/VS2 :- Very Slightly included (two grades). Minute inclusions very hard to detect with the naked eye. SI1-SI2 :- Slightly included (three grades). Small inclusions only sometimes visible to the naked eye. I1-I2 :- Inclusions visible to the naked eye yet lots of life and sparkle. Great value and still stunning. I3 :- More heavily included and easily visible with the eye often milky stone with little sparkle. We are a big diamond jewellery wholesaler with more than. We offer great deals on the best styles and qualities. We offer a wide range of Certified Diamonds & Fine Jewellery certified by GIA, EGL, IGI, etc. All of our items are brand new. All of our Gemstones & Diamonds are 100% genuine and natural. The Internet changed all that. The amazing power of the Internet made it possible for us to offer our fine merchandise directly to consumers. This way we are able to offer low prices to match our high quality. Our customers benefit because we are diamond jewellery wholesalers who can sell to them directly. Because we control the entire process from source to final product we control the costs and are able to maintain the highest quality and to pass savings to our customers. With our old world values and traditions and our mastery of the most advanced Internet technologies, we truly offer you the best of both worlds. Bank Transfer BACS or CHAPS. Bank Deposit to our account (this shows up instantly). Wire Transfer - International buyers. All of our items come with a 100% guarantee. Your 100% satisfaction is our top priority. We want you to be 100% happy with the products you receive! GMT, Monday through Sunday, within 30 days of receiving your order for a return authorization number. Your Satisfaction is important to us! We want you to be 100% satisfied with your shopping experience and we offer unparalleled customer service. Our Diamond and Jewellery consultants have the knowledge to help you make the right decision. UK Customers : 0207 404 0492 / 02033717398 / 07960083955. Customers Outside UK : 00 44 207 404 0492. You can visit us in Heart of London Jewellery District, Hatton Garden. 7,88-90 Hatton Garden London EC1N 8PN. 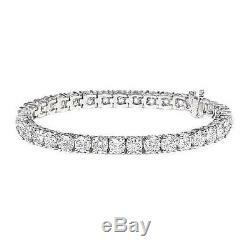 The item "5.00 Carat Round Diamond Claw Set Tennis Bracelet Crafted in 18k White Gold" is in sale since Saturday, March 05, 2016. This item is in the category "Jewelry & Watches\Fine Jewelry\Fine Bracelets\Diamond". The seller is "fine-diamond" and is located in LONDON, london.